I am not really sure how to sum up the past few days. And where do I begin? Do I start with all the good that has happened or do I share the bad moments first? There have been many of both. It has been a bit like two steps forward then three steps back. Although the steps have been more like leaps so I really can’t complain. Honestly it has been a bit overwhelming and I am just now catching my breath from it all. I will need to break this up over a few posts as it is just way too much to tell in one. So I guess I will just go chronologically with events. Unfortunately that means starting with the bad. Friday had to be one of the worse days for Jay, well really all of us. His meltdown was of such gigantic proportion that I am not even sure if I can even possibly put it into words. And the worse part is that I pushed him to it. Do you have any idea how bad that makes me feel? We were going to have Friday Choose Day, you know where the kids get to pick what they want to do. Well I soon learned that having too many options, so much freedom, that is very hard for Jay. What was even harder was not being able to do the thing he did chose to do. There was no way I was going to take him to go play paint ball, something he has never done before, by myself. No that would be something that would require Daddy having to be there. Not to mention that this was not something that Gracie could do. What was I suppose to do with her even if I did agree to this? I tried to explain to him this but he was not having it. The discussion ended with Jay sitting in his closet mad at the world… well mad at me. In an effort to make things better, more fun, I set up a tent in the middle of their playroom and let them eat their breakfast there. After breakfast I suggested that Jay get one of his Harry Potter books and read to us there in the tent. Gracie, who has never been a Harry fan, was so excited about being in the tent that she decided to turn our tent into a clubhouse. So there in the middle of the room we invented the Harry Potter Clubhouse.We sat there passing around the book taking turns reading for almost 2 hours. It was delightful. So you are probably wondering where is the bad part… I said that this was the bad day… it sounds pretty good right? Well I should have stopped while I was ahead. Since we were having so much fun, I decided that we should keep the tent up in the playroom, ALL THE TIME! In order to do that though we would need to move some things around and rearrange. So instead of this being Friday Choose Day… it became Friday Moving and Cleaning Day. Ahhh… now do you see where this is going? I knew this would be difficult for Jay so I told him he could just hang out, play his DS or even watch TV. I also told him that I would only move Gracie’s toys not his. Basically I told him, no I promised him, that this moving stuff had nothing to do with him so he did not have to worry. Gracie and I rearranged her room and turned a bookshelf sideways to put her toys in it. We even created a bunk bed for her dolls. Okay I know that this post is not about this but it came out so cute that I just had to share the picture with you. Back to the story. At one point I asked Jay if he could just hand me a garbage bag. He said no. To his defense I did ask instead of just telling him to do it. In hindsight I know this, but at the time I sort of lost it. I snapped at him about how hard Gracie and I were working and that all I asked him to do was hand me the bag and he couldn’t do it. He was confused… after all I had told him he did not have to be in involved with this project. He tried to express this but could not find the words and instead yelled and once again ran to his closet in his room. Then came lunch. I had planned on warming up the leftover meatloaf, but Jay wanted Spaghetti O’s. By this time he was like a loose cannon just ready to blow and so… he did. AND let me tell you he blew! I was actually taken back, shocked and left wordless. He just kept going and going. His words were pure venom. I couldn’t believe he was saying these things. “I hate you. You are always trying to control me. You can’t control me. I’m not your puppet. You can’t pull my strings!” On and on and on it went. This was not my boy talking… this was Autism, this was sensory overload. I knew that in my head but my heart just ached. I finally came to and told him that was enough. I told him that he needed to take himself somewhere else and calm himself down, that I was not going to talk to him like that. Then I sat down at the table with Grace to have lunch. This made him even more mad. He started in with how if you looked up “bad mom” in the dictionary you would see my face. (This actually was quite funny but I did not dare laugh out loud.) I was a bad mom because how could I let my own child stave to death. Once again he went on and on. I ignored him and ate my lunch. I will end part one here… nicely, because believe me the next part gets uglier. Actually scarier would be a better word. But that will be tomorrow’s post. Sometimes It is hard to do the right thing or even know if it is right. I care for my 3 grandchildren every other week. The 13 yr old( Mina )has anixity issuses and sometimes I push the wrong buttons before I know it. I realy sympathise with you. oh mommy! been there done that…got the t-shirt! 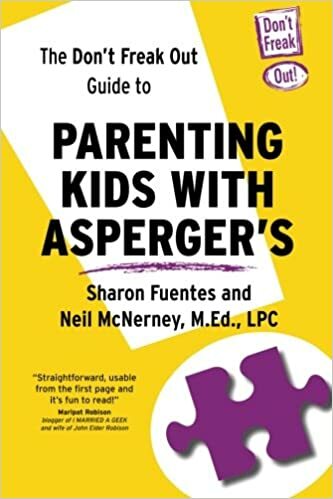 I say, you haven’t made it as an Aspergers parent if you haven’t been told “I hate you!” by your child. Congratulations! You’re official. What struck me the most about this post was Gracie’s reaction. Siblings really are the unsung heros, aren’t they?